This award, given by the Journal of the Mechanical Behavior of Biomedical Materials, aims to give recognition to an early career researcher working in the field of interest of the journal, who has shown promise as evidenced by scholarly publications and leadership in research activities. A certificate recording their achievement. Free registration and an honorarium of $500 towards their travel expenses to attend the 6th International Conference on the Mechanics of Biomaterials and Tissues, at which they will be invited to take part in an award ceremony and to make a presentation on their work. 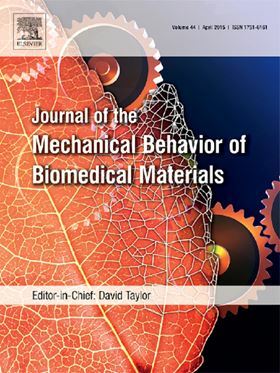 Membership of the Editorial Board of Journal of the Mechanical Behavior of Biomedical Materials for a period of two years. During this time the awardee will act as guest editor for a special issue of the journal, assisted and mentored by a member of the Board.